Midland residents will see work start in mid-July on the nearly 17-acre Larchmont Wetland Reserve to reduce flooding in the surrounding neighborhood and provide habitat for wildlife and improve the quality of stormwater runoff. The Pierce County Public Works and Utilities project is located east of McKinley Avenue East and between 91st and 96th streets. Midland residents are asked to be aware of construction traffic and, for safety reasons, avoid entering the construction site. Work on the site includes modification of drainage ditches on the property that impact existing wetlands. Crews will also excavate a seasonal pond to provide habitat for animals that depend on wetlands. This wetland project is proposed as a “bank” to help public projects and private developers mitigate for impacts to wetlands on construction projects in the same basin. Qualifying public and private projects located in the same basin would pay a fee toward developing and maintaining these wetland areas, like Larchmont, and relieve the project developers from any further mitigation burden. The In Lieu Fee Program is in development pending approval by the County Council and state agencies. 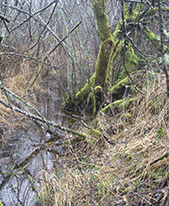 A branch of the north fork of Clover Creek flows across the property and is an important part of the plan. Most of the $704,000 project is slated for completion in September, though native plantings will be installed later in the fall. A grant from the Washington State Department of Ecology is funding the project. Active Construction, Inc. of Tacoma is the contractor. For more information about construction of the Larchmont Wetland Reserve, go to www.piercecountywa.org/larchmont. For more information about development of the In Lieu Fee Program, go to www.piercecountywa.org/inlieufee.